Call 407-397-2378<"+14073972378"> for an Entertaining Cast Recorded Preview, Information and Reservations. Capone's Dinner and Show welcomes guests that have visited the Villages1 web site! We would like to offer you over Half Off All Tickets for every adult in your party PLUS a free gift for each paid adult ticket. Print the coupon below and present it at the box office when you arrive for your reserved show! Instead of $69.99 per adult, our Villages 1 special rate is only $34.99 for adults and $22.99 for kids (plus tax and gratuity). If reserving by phone, please tell the representative you are wanting the Villages 1 Special, then print the coupon below and present it at the box office when picking up your tickets. If you are ordering tickets online, you will receive half off all tickets automatically. Click the "Buy Now!" button below. Print the coupon from this web page and present it at the box office when you arrive for your reserved show to receive your free gift! 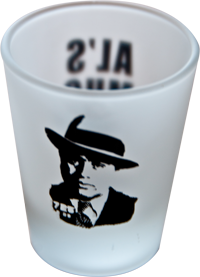 Each paying adult guest receives a free Capone's shot glass! Want to reserve your tickets now at half price? 1/2 off regular prices, valid only at Capone's box office. *with discount. Prices subject to change. Not valid for New Year's Eve Gala. One Free Shot Glass Per Paid Adult. Must present coupon at the Box Office. *Gratuity not included in these totals. For parties of 10 or more there will be a partial gratuity collected at check-in. Since 1992 we’ve entertained guests with our one-of-a-kind prohibition era speakeasy. We hope you will spend some time browsing our web site where you'll find our menu, specials, more information about our show, guest comments, reviews and much, much more. Be sure to save a night for Capone's Dinner & Show, you'll be glad you did! We are one of Orlando's top dinner shows. It isn't easy being listed with Triple A as a 'listed attraction.' Read our reviews, and we think you will realize, Capone's Dinner & Show is a great Orlando dinner show to choose when considering attending a local dinner theater. Is today a special day? If the night you will be visiting us is a special occasion, be sure to mention it when you make your reservation! 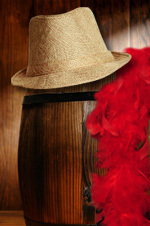 Buy your gang a classy fedora or fancy boa to wear during your visit! You can order them now and have them waiting with your tickets at the Box Office!